The Guardian Travel Section 2014 Top 10 beach and coastal campsites in France On Saturday 29th March 2014 The Guardian very kindly voted us as one of the best beach and coastal campsites to visit in France. Being as how France has more campsites in their country than any other country in the world, we are quite proud of this! Here is what they had to say: Kick off your shoes at these campsites along the coast of France, staying in a tent on the dunes, a posh tipi or a cool cabin right on the beach. 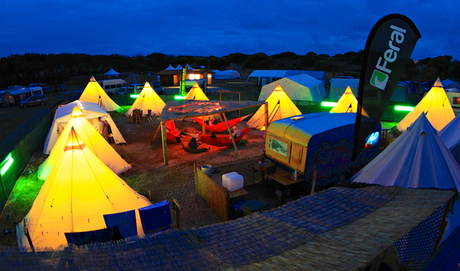 Amid pine forests and dunes just 50 metres from the sea, is a pop-up camp where surfers can stay in tipis with beds, carpets and electricity. An onsite chef cooks your meals, and there are nightly campfires and beach parties. It’s suitable for all, including beginners, and a daily surf lesson is included in the price. The site is 25 minutes from Lacanau-Océan, a surfer hangout with bars, restaurants and clubs. 0800 6123 516 feralsurftours.com Open June-September, three nights from £210pp, including accommodation, two surf lessons, equipment and all meals.